This was definitely the longest hiatus in We Are Never Full history (bear in mind our history is only a measly 27 months) but, finally, we’re back! (exactly a month to the day since we went away) You may not be as excited as we are to be slowly getting back to normal, but if you visited us right now in our new apartment you’d notice how far from normal our living conditions are. After almost 3 weeks of eating take-out and restaurant meals, we spent our Labor Day doing hard labor. A day in a North Korean Labor Camp would’ve felt better to my legs and feet than a day trying to set up shop in our new place. Oh, and a tip to anyone moving after accumulating five years of crap (along with a fear of throwing things away), PAY PEOPLE TO PACK FOR YOU or at the least pay people to move everything you own for you. Maybe it was our youth, maybe our naïvete, maybe our pride, but we really thought it was a great idea to pay movers to move only our furniture because we could “get the rest ourselves”. Let’s put it this way, my thighs look like this after walking box after box (after box) up to our new 3rd floor walk-up over the past few weeks. Oh, and did I mention my three-days of shredding a 30-gallon garbage bag full of “I’ll get to shredding it next weekend” bills/credit card statements/etc. Guess what, Amy? 2004 was five years ago – you didn’t shred it “next” weekend. But, the craziness is almost over now. In a few weeks, we’ll be more settled after we buy a few more pieces of furniture and put those last few clothes away. The kitchen, of course, was the first thing we worked on. Our new kitchen has a bit less cabinet space than our last one and a smaller refrigerator, which isn’t great given the many, many dry goods and countless bottles of condiments we own, but we’ve just about found a home for everything, and we’ll be okay going forward if we make sure to limit our worst excesses at the grocery store. 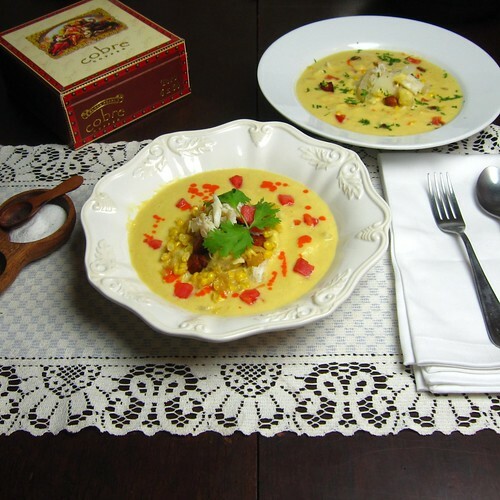 So,the first meal we made in our new apartment was a simple, seasonal farewell-to-summer cream of corn and crab soup with a chile emulsion using much of what is readily available in our neck of the woods. Corn is coming out of our wazoo and is about 15 cents an ear; the bay at my parents’ shore house is full of crabs; our pepper plants are almost ready to die, but have given us many, many spicy cayennes, cowhorns and red hots. And the yucca, well, it’s not exactly local and may not be as easy to get depending on where you live, but substitute a potato and you’re good to go. Strangely, a soup was actually very satisfying since the weather, coinciding uncannily the start of the school-year, has actually turned kind of cool. Thanks for sticking with us through our hiatus. We hope you really enjoyed your summer and we can’t wait to start cooking some cool-weather meals for you. Until then, crack open a cold one and enjoy the last few days of summer. 6-8 of your favorite fresh hot red peppers (cayenne, cowhorn, mirasol, fresno, etc. ), sliced length-wise in half. Toast your chiles in a hot dry pan until the air around your stove makes you cough, or the peppers are starting to burn in a couple of places. Transfer peppers to your blender and set it to liquify. Add the oil slowly while blender is running, until you’ve got slightly thick sauce. Again while blender is running, squeeze in lime juice to loosen it slightly. Your condiment is ready. Pour into a squeezy bottle for easy serving. Heat large pot to medium, saute chorizo to render its fat. Remove with a slotted spoon to a plate. Add onions to pot and saute until translucent in delicious orange chorizo fat, about 8 minutes. One minute later, add the corn. Saute the corn for 3-4 minutes before removing 2/3 cup of it to a plate. After a couple more minutes, add two cups of your stock and cream. Bring to a boil and simmer for about six minutes, or until corn is softening nicely. Adding the liquids from your pot, continue to puree until you achieve a smooth, medium-thick consistency. Return soup to pot and reheat to a gentle simmer. Add crab to soup and stir well. Allow to simmer for 1-2 minutes. Your soup is now ready. Ladle it into bowls and garnish with yucca, chorizo, and reserved corn pieces. Dress soup to taste with your homemade fiery condiment! Moving is hard work. I’m glad you found the energy to make such a delicious-sounding recipe! Welcome back Amy, and thank your for the delicious recipe. Welcome back, and OMG that soups looks amazing! If I didn’t have a plan for the sack of organic corn on my counter, I might be making soup, like right this minute. At 10 in the morning. ‘Cuz, well…..I love corn. And soup. I’m glad it’s over, I was missing you and your funny posts! Now — the soup. Oh, gosh yum. Corn and crab would have satisfied me, but the chorizo and yucca…holy cow. You even added a little bit of bite with that chile puree just for me. Love it. Welcome back! Hope you adapt well to your new place. Oh my, that soup looks delicious. congrats on almost being done moving. Back with a vengeance! You hit all the sweet and savory spots with this. All i can tell you is that there’s was a void in the food blogosphere during your absence. 🙂 I’m happy the move is ‘almost’ over. 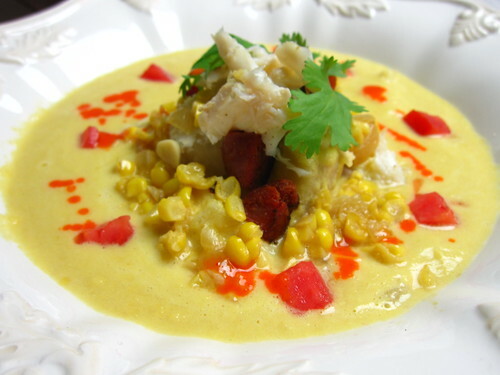 Love the use of yucca and chorizo in this cream of corn. Sounds fabulous! Glad you’re back! I was afraid you had drifted into oblivion! The first time I hired movers I was amazed at how wonderful it is, and swear I will never move myself again. And if that soup can’t make you forget your pain…………..looks delicious. 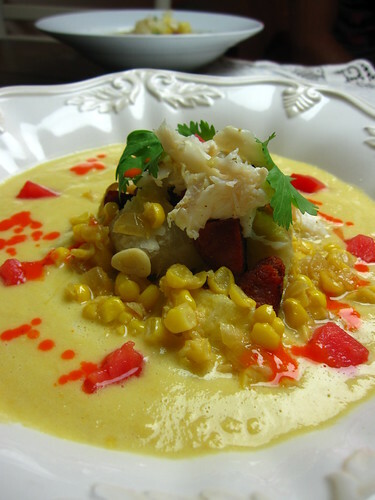 Love the Latin spin on the corn soup (of course you knew I would!). So are you still in Brooklyn and was that an invitation in the first paragraph when you said…’if you visited’? Joan – you are ALWAYS welcome as a visitor. In fact, now that we have a second bedroom, bring all your stuff – you can move in!! Glad you had some time off…The soup looks incredible, a nice way to finish summer! Welcome back! And ugh, moving is the worst! I can appreciate the move. I relocated our 10,000 sq ft office last year. I agree about the hard labor camp! Love the corn soup! We’ve got “corn coming out of the wazoo” here too. I grilled some last night for a hearty maque choux, yum! Note to self: See doctor about that “corn/wazoo” business, it can’t be right. LOL, Chris. Note taken. It’s now on my long list of “to-do’s” after “get feminine thighs back”. Looks wonderful. 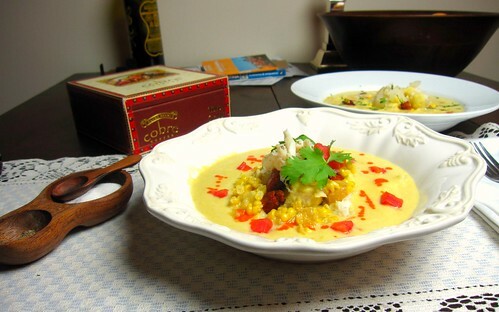 I just posted on my blog today a Steamed Corn Custard with Crab. I think corn and crab make a lovely pair. Good luck in your new place! Ah paper shredding. I need to get onto that ASAP. Welcome back and bless your new home. The soup looks heavenly and so beautiful! What a great way to say goodbye to summer and welcome the heartiness of fall and winter dishes. Delicious!! Aaaaaahhh, you always bring a smile to my face!!! Only humans step on the same stone twice… do you know about this saying? Well, I moved twice and packed my things twice without any help… but, I tell you, next time the guys in charge will do it for me! Welcome to your new home. May you be very happy there! Summer does have to end, doesn’t it? At least the farm markets will be churning out some good fresh produce for a few more weeks. Let’s hear it for the corn! I love corn soup. Welcome back guys! Glad to hear you’re all settled in. Where are getting corn for .15 an ear? Everywhere i look it’s 2 for $1. chica. wassup. sure do miss u coming by. i’ll be up there on teh 29th/30th for 24 hours. got time to hook up? welcome back. love the yucca! you know it’s right up my alley. i’m actually doing yucca fritters this week. I did miss you actually, your irreverent humor, originality and honest voices in this funny world of food blogs. I had already planned to throw money at other people to do the legwork the next time we move but a reminder is always good. This looks fantastic. Thanks for visiting my blog. Love yours~!